Pocket Tuples, by Nimblebit, is a game where you are trying to collect a large amount of experience points. You do this by generating 3-tuples of numbers from the tuples you already have. A tuple looks like this: (X, Y, Z). Each member of a tuple is an integer. At the moment, X may range from 0 to 22, Y may range from 0 to 15, and Z may range from 0 to 103 (although Z is also bounded by a function of your XP total). Game updates have increased these ranges. You begin the game with two tuples in your collection. You can construct a new tuple from two input tuples: each element of the output tuple is copied from one of the two corresponding elements in the input tuples, selected at random. Thus, the tuples (1, 1, 3) and (2, 2, 3) can generate four equally-likely results: (1, 1, 3), (1, 2, 3), (2, 1, 3), and (2, 2, 3). The new tuple is placed in your collection, but you don’t know its elements for a certain period of time; this time monotonically increases as a function of Z. You can always combine two tuples in your collection once you know their elements. At times, you are offered the opportunity to buy new tuples or to combine a tuple in your collection with a randomly-selected tuple. The size of your collection is limited, but it can be increased by spending currency, either virtual or real-world. Once your XP total is sufficient to make all values of Z available, the primary remaining goal is to reach a state where all 38,262 possible tuple configurations have, at some point, been in your collection. Pocket Tuples is a very boring game. In the early 2000s, there was a lively debate among academics who studied video games. The “ludologists” claimed that the valuable parts of games, from a critical perspective, were the formal systems and rules they applied. Stories and visuals — “aesthetics” — were ultimately superfluous. The “narratologists” disagreed. They claimed that the valuable part of games was the narrative. The interesting thing about games, they argued, is their novel way of telling stories, which involved rules simply as an inconvenient side effect. Of course, as is painfully obvious in retrospect (and, truth be told, was probably obvious at the time), the real answer is somewhere in the middle. The interesting thing about games and game design is the interplay between a game’s aesthetics and its rules. Pocket Tuples is a boring game, and a choose-your-own adventure about breeding frogs wouldn’t be very fun without a good system under the hood (although Tom McHenry’s horrific Horse Master might prove that statement wrong). The math above is a way of describing the rules of Pocket Frogs. The game only achieves its design unity by casting those systems in the guise of frog breeding. Frogs have one pattern and two colors. Breeding two frogs results in a child that selects its traits randomly from its parents. When you select a pair of frogs for breeding, you see all of the possible child frogs laid out in a dialogue box. Breeding two identical frogs is guaranteed to get you an identical child frog, but in order to generate new frog designs you must breed two distinct frogs, and thereby cast the dice. If one trait differs, you will produce a child that looks like one of the parents but not both. A flip of the coin. If two traits differ, you have four possible children: one like each of the parents and two entirely new. A 25% chance of getting the frog design you seek. If all three traits are different, your result will be one of eight possible frogs. Genetics. Math. The game’s challenges require you to understand this system and play the odds. 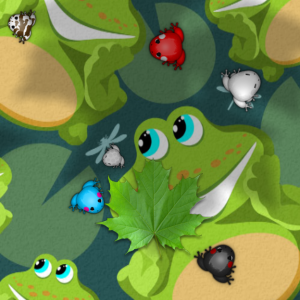 It shows you a specific set of frogs to produce and lets you work out how to create them. It’s raw numbers clothed in colorful amphibian skin. It’s elegant. Frogs isn’t the sort of game I play for fun. I first played it five years ago as part of the judging process for the 2011 IGF awards; I took a look at it again by request of one of my patrons. I’m glad I did. I find myself wondering what a more complex version of this game would be like, maybe with Mendelian dominance tossed in. For now, though, my Froggydex is 0.0002% complete. Only 38,262 tuples to go.